Formed in 1985, Bay Area band Insanity were instrumental in metal's evolution from thrash to death metal. Drummer Bud Mills was a big reason why, as his so-called "1-1" beat presaged the modern blastbeat. The band's sound more than lived up to its name. Not only did it crank thrash up to frenzied warp speeds, it also displayed chops well ahead of its time. Insanity were legendary worldwide in the '80s metal tape trading circuit, with members of Carcass and Napalm Death citing them as an influence. However, the band never achieved proper success due to various misfortunes. Insanity's inaugural lineup comprised vocalist Joe DeZuniga, guitarist Dave Gorsuch, bassist Keith Ellison, and drummer Bud Mills. Their 1985 rehearsal demo, recorded with a Walkman and a stereo microphone in a garage, gained global renown in the metal underground. Napalm Death later covered "Fire Death Fate" on Leaders Not Followers, Pt. 2, and Snakepit magazine reissued the demo on 7" with its 15th anniversary issue. 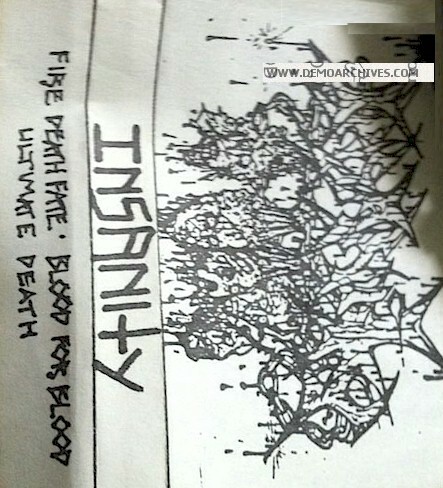 Insanity made its storied live debut on October 19, 1985, opening for Death in Bay Area metal hotspot Ruthie's Inn. However, two events derailed the band's rising career. The first was Mills' incarceration for ten months; the second was DeZuniga's death from heart disease on May 16, 1987. After DeZuniga's passing, the band struggled to maintain a consistent lineup. A debut full-length, Death After Death, ensued in 1994 on German label M.B.R. Gorsuch was the only founding member still in the lineup, which included Matt Janko on guitar, Joe Landers on bass, and Prakash Sharma on drums. Xerox one panel cover. Tapes varied. Pro cover with commercial tape. Xerox cover with commercial tape.